Turning on EWTN for a moment this morning, I was reminded that today is the day of the beatification of the parents of St Therese at Lisieux. Of course, the annals of the saints contain many examples of parents and children who have been raised to the altars: St Helena, mother of St Constantine; St Monica, mother of St Augustine; St Wilfrida, mother of St Edith of Wilton; St Ethebert of Kent, father of St Ethelburga (who married St Edwin of Northumbria). But it's unusual for both parents of a saint to be recognised for their sanctity, especially in the modern age. I hope eventually they will be included in the Universal Calendar (presumably after their eventual canonisation, Deo volente) since the Martin family remind us that holiness is possible in a modern family and that, with the help of God's grace, the ups and downs of family life are a means to this. Indeed, despite their many secular responsibilities, both Louis and Zelie had deep prayer lives and made their family a veritable domestic church. The fruits of their love and devotion can be seen in the subsequent lives of their daughters - all of them (eventually) nuns and one a Doctor of the Church (whose relics will 'tour' the UK next year). 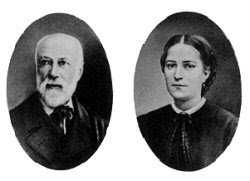 Louis and Zelie also had to face many trials and both died after long and painful illnesses (in Zelie's case, at a young age).